Bill Reimer, in his natural habitat. For 29 years I have worked in the back corner at my desk on the floor of the Regent College Bookstore, surrounded by volumes of biblical studies and commentaries. We have 272 linear feet devoted to biblical studies and 120 feet to theology. Additional footage is devoted to a broad range of Christian studies: poetry, literature, history, biography and of course a good selection of Bibles; even 40 feet for C.S. Lewis and friends. If you have travelled this continent or been abroad then you know that there are literally only a handful of theological bookstores that remain. In a bookstore it is “Christmas every day.” Last month Tim Keller’s new Prodigal Prophet came in the door, this past week Diarmaid MacCulloch landed with a thud, and this week we expect the arrival of Becoming Gertrude by our own Jan Peterson whose husband, Eugene, we dearly miss. 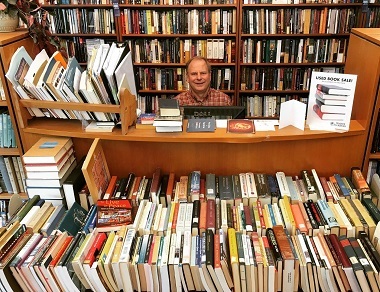 How has bookselling changed people often ask me? I once wrote a blog about this: “The World is Flat and a River Runs Through It.” Since then the world of bookselling has changed forever. In some ways books have become more accessible in remote places. But much has been lost. Regent Bookstore remains one of the few stores in the world, on a public university campus, that sells a wide selection of books in the area of Christian Studies. Regent Bookstore is non-profit and is owned and operated by Regent College. All proceeds go towards the operation of Regent College programs. Regent Bookstore is an employment centre for Regent students and their spouses. Regent Bookstore sponsors lectures by authors and speakers. All of these observations still apply to Regent Bookstore in 2018. We remain on the UBC campus and have regular customers who are agnostics or atheists but they tend to like this place even though as a religious institution there is an invisible barrier around it in the eyes of many. The printed word remains also today an ideal tool of Christian proclamation facing a powerful spirit of secularism and Godlessness: it may well again prove a sling of David for a giant doomed to destruction. If he shall not lose his reward who gives a cup of cold water to his thirsty neighbour, what will not be the reward of those who by putting good books into the hands of those neighbours, open to them the fountains of eternal life? This is a collective challenge to the church. Many bookstores have survived by “crowd sourcing.” Thus far Regent Bookstore has not needed a fundraising campaign in order to continue on. You enable us to exist by buying books for your edification. Consider buying a book, reading it, and then passing it on to a friend. Finally, if you live afield then consider supporting us by purchasing downloads of Regent lectures at regentaudio.com. And thank you for your support over these past almost 50 years. I think of Bill Reimer as ‘Dr. Book.’ I like to discuss my Christian wonderings and ask him for recommendations. I am never disappointed! The Regent College Bookstore might well be a wonderful resource for scholars and academics but for an average layperson, it is also pure gold and reading Bill’s suggestions has enriched my Christian walk immeasurably.